This fabulous image was provided by the man behind The Spine. These words were provided by me. Same goes for the ones below. If there’s one field of policy where Livingstone has won the campaign by a clear margin, it’s that of transport. The Blond came a cropper early on. The damage done by his mistaken assertion, made at the end of February, that he could equip the capital’s busy bendy bus routes with conductors for £8 million has never been repaired. Invited to cost his entire scheme for replacing every bendy with a “21st Century Routemaster”, conductors and all, he initially argued that he could not anticipate the price of a bus that had yet to be invented. 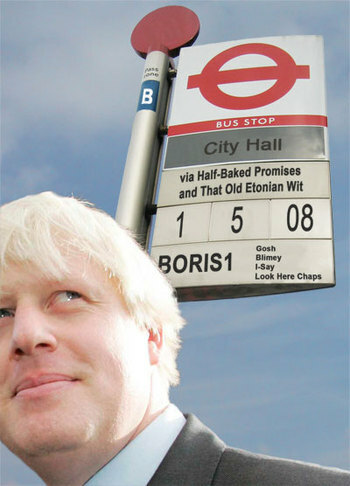 Then he let slip to a woman in Edgware that, in fact, he thought the new buses would cost about £100 million. If we accept this price and add to it the true cost of conductors for the bendy routes (training, equipment, wages and so on), plus likely additional drivers and you’re looking at £130 million at the very least – a figure even higher than the one Team Ken alleges. The policy is a speculative mess. By contrast, even Livingstone’s most hostile critics admit that bus services have been transformed under his mayoralty, and no one has torn apart his plans for continuing this. What about the London Underground? Stand on the westbound Central Line platform at Bethnal Green during the morning rush, and it’s hard to imagine how the agonies of Tube travel could be alleviated. Trains arrive in rapid succession, yet each is so jam-packed that waiting passengers can only stand and watch them leave. So what do the two main candidates propose? Livingstone, who’s just enabled the disastrous Metronet Tube maintenance PPP consortium to be brought under TFL control, has a list of things he’ll expect to deliver, including starting work on the huge Crossrail project, which will link Heathrow to the City and Thames Gateway and take some of the strain off the present network. Johnson’s manifesto offers little that is different and less detail. Livingstone has acquired the expertise that comes with experience whereas Johnson cannot tell us who his transport specialists are going to be. Which of the two would you prefer in charge? What would these policies mean? Re-phasing traffic lights implies their staying on red for shorter periods. Where does that leave the pedestrian? Running faster to cross the road, that’s where. Johnson’s different c-charge payment system – moving to an account-based system – looks sensible and workable, but it’s there to validate the disgruntlement of those who resent being hit with fines or non-payment. His re-opened consultation on the western extension is effectively a promise to get rid of it; a promise to gratify the affronted, affluent Tory voters who predominate in that part of town. As for his “flexible pricing system,” it is no more than an airy aspiration. Car-friendliness is the one respect in which Johnson’s transport plans differ philosophically from Livingstone’s. Otherwise, they obey the general rule of his campaign, which has been to pose no fundamental threat to Livingstone’s legacy and concentrate instead on anxieties about antisocial behaviour and suburban grievances. It’s a strategy designed to allay fears that a Johnson mayoralty would be wild or radical, and to that extent it succeeds. Yet this also obliges closer concentration on the respective candidates’ competence to put their programmes into effect. Johnson has offered little that is new and has screwed up his flagship policy. Livingstone, meanwhile, has a good record of delivery. In some areas of mayoral responsibility – such as housing and policing – the argument about which of the two is better is quite finely balanced. In transport, where a mayor can make a big difference, Livingstone has won it decisively. As posted here earlier today. And it appears that Team Boris have come up with an absolute transport howler. Their latest backer, Brian Cooke, launched into a blistering attack on the 24 Freedom Pass in a Boris Johnson campaign statement. He called the extension of the scheme "a mad idea" and "plain daft". This, despite earlier protestations from the Boris Johnson campaign that that they would support the scheme and that arguments to the contrary were a smear. As Graham says - Cooke's endorsement contains a slamming of Johnson's own policy. Seems pretty clear, he thinks Boris will do a great job but disagrees with his flagship bus policy and 24 hour Freedom Pass. There's also a logical inconsistency where he claims that because there's likely to be a Conservative administration in Westminster before the end of the current Mayoral term Boris is better placed to work with them, but the current Labour administration would work perfectly well with Boris. Why then would a future Conservative administration not work with Livingstone, then. What are they planning? In any case, why should we vote in London based on what might happen nationally in two years time?